Malayalam actress and Internet wink queen, Priya Prakash Varrier is raising the temperature with her latest pictures. Lately, she took to Instagram to share her pictures in a wine colour dress teamed up with white sneakers. She has accessorised her look with geeky spectacles, subtle makeup and a neat ponytail. In the pictures, she is seen posing romantically with her Oru Adaar Love co-star Siyadh Shajahan. Needless to say, she looks breathtaking in the pictures and a perfect ambience adds a glow to her face. Currently, the lovely lady is gearing up for her Bollywood debut film Sridevi Bungalow. However, the film is in a soup of controversies with Boney Kapoor slamming the legal notice in the makers and the actress. Priya Prakash Varrier became the talk of the town and the ‘national crush’ after her popular wink went viral from the song Manikya Malaraya Poovi from her maiden Mollywood film Oru Adaar Love. The song made her internet sensation overnight and since then there is no stopping for her. 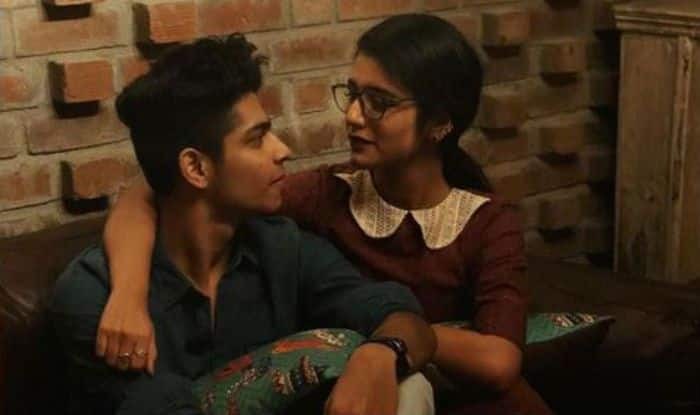 Along with Priya, Oru Adaar Love also features Siyadh Shajahan, Roshan Abdul Rahoof, and Noorin Shereef in important roles. It is all set to hit the screens on February 14, 2019, Valentine’s Day.